What inspires me: The midwives who work here every day – my sisters I see you and you inspire me. Best advice: You get one shot at life – this is the main event – so live life with passion. Explore, inspire, go for it. 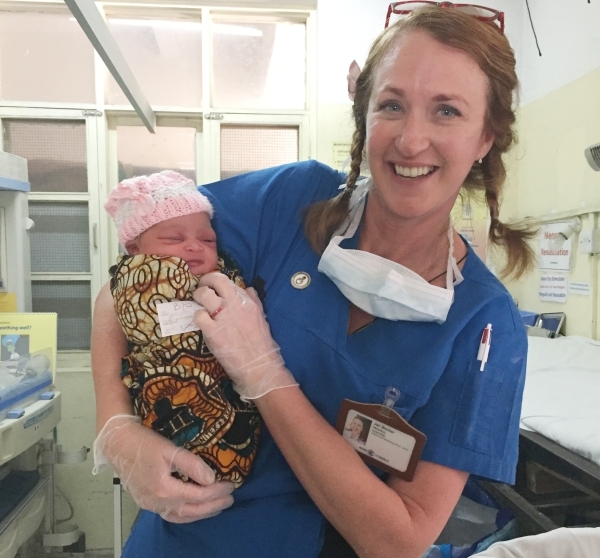 Jan Becker and her daughter Chase Becker strode into Amana Hospital in Dar es Salaam Tanzania for their shift as volunteer midwives in the labour ward. It had been a tough visit so far, with a severe midwife shortage making already trying conditions tougher. This morning, Jan and Chase arrived to find a single midwife attending eight women in late stage labour. Dozens more women endured the agony of labour in a nearby early labour ward. They glanced at the bench at which dead babies are placed awaiting the morgue. Relief. No deaths overnight. Assessing all the mothers, Jan moved to one mother on the verge of delivering while Chase attended another. Chase soon called out to Jan, a specialist in neonatal resuscitation. A newborn had no heartbeat. Jan started resuscitation but soon realised the baby was stillborn. Despite its perfect appearance, it had died weeks before in its mother’s womb. With insufficient Swahili language skills to explain the death of her child to its mother, they awaited a local staff member to explain the baby had died. The mother, thinking her seemingly perfect baby was asleep, cradled its tiny form, tenderly shielding its lifeless eyes from sunlight streaming into the room. While Jan fought back tears at yet another dead newborn, she attended to another labouring women, whose unborn baby’s heartrate was plummeting. Fearing another stillbirth, Jan accompanied the mother to surgery for an emergency Caesarean. But as they prepared for surgery the baby delivered naturally. This time, the baby survived. Nearby another six women continued their labour. Jan and Chase and another midwife delivered nine babies in an hour. This was a busy but normal morning at a single hospital in which 80 to 100 babies are born every day in a country with one of the worst maternal and newborn baby mortality rates in the world. Chase delighted with so many healthy new babies. Still, conditions had improved considerably since Jan and Chase had first visited this hospital as volunteer midwives five years ago. 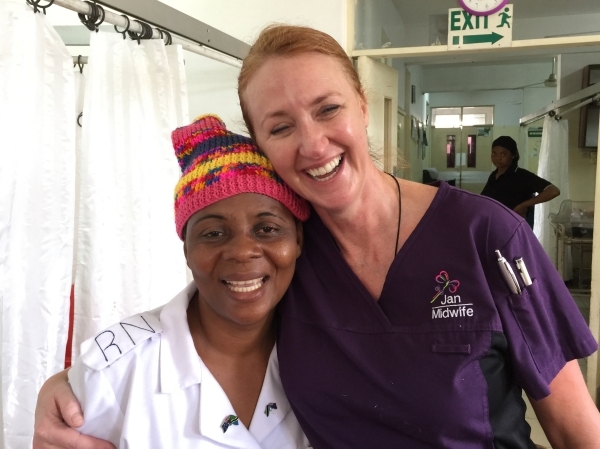 Thanks to the charity Jan founded, Midwife Vision, the labour ward now had running water with a sink and pipes, reliable electricity, more medication and even ceiling fans. Jan will never forget the sheer sense of overwhelm when they first visited. They knew it would be tough. They’d sought out a volunteering opportunity in a place where they felt they could make a real difference. Jan’s research had revealed that 80 to 90 percent of the world’s maternal and neonatal mortality occurred in Sub Saharan Africa. She learned that Tanzania was among those nations struggling to overcome this by meeting the United Nation’s Sustainable Development Goals. And she knew Tanzania was desperate for midwifery help. 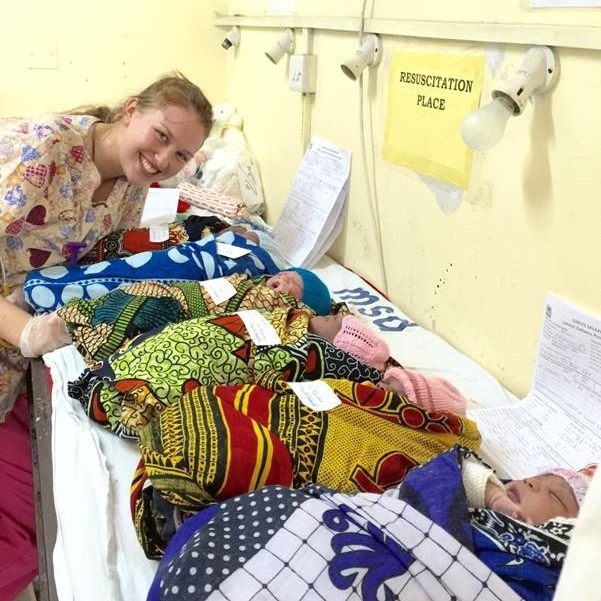 But after weaving through the teeming streets of Dar es Salaam to the hospital on their first visit, Jan and Chase could never have envisaged what they would encounter. The labour ward at which they were to work was a small, hot room, packed with eight basic benches, rather than beds, at which women gave birth. There was a tap but no running water, poor electricity supply, no pain relief, no nappies, no sanitary pads, no food unless families delivered it, and only basic medication. Groaning, wailing women filled each bench and, in once instance, Jan delivered a baby on the floor. 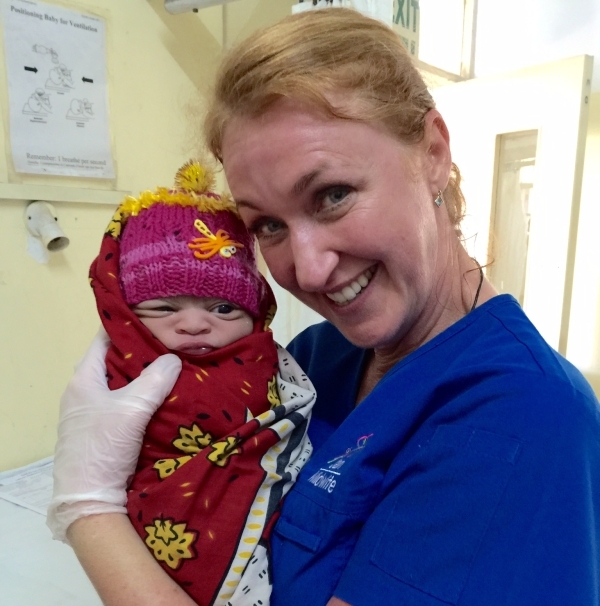 Devastated by the rate of neonatal deaths, Jan pledged to return to Australia, and study in the United States, to specialise in neonatal resuscitation for places defined as ‘Limited Clinically Resourced’ areas, like Sub Saharan Africa. 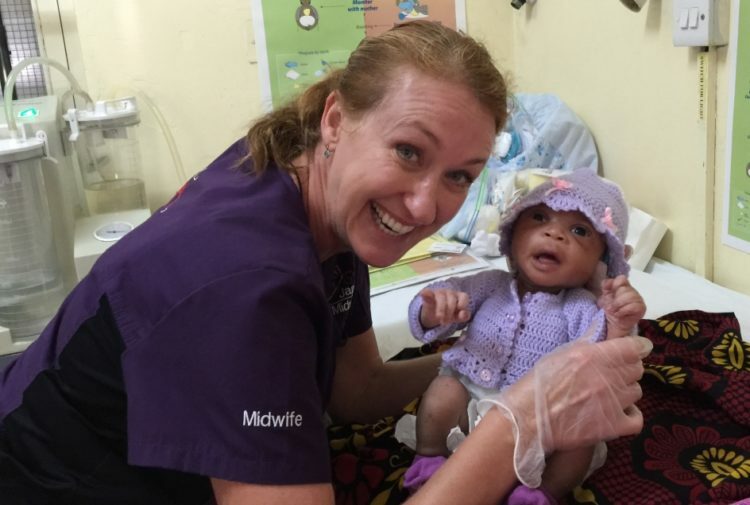 She’d already gained years of experience as a nurse, working in accident and emergency and, later, as a midwife, including several years’ midwifery in New Guinea. But this was different. The conditions were so basic. The need so great. She’d need to learn so much more. Jan uses a new ultrasound machine. The machine detected signs of life in an unborn baby that had been presumed dead. Since its inception 12 months ago, Midwife Vision has helped fund running water at the hospital, provided reliable electricity, added ceiling fans and painted and refurbished the labour ward and maternity theatre. It has donated medication, oxygen concentrators, baby cots, ICU beds, observation machines, suction machines, theatre operating lights, theatre operating beds, anaesthetic equipment, baby resuscitation equipment, gloves, scrubs and surgical instruments. Midwife Vision has also introduced training for local staff and health awareness-raising for pregnant mothers. They’ve funded birth kits for new mums who can’t afford them are in the process of introducing initiatives such an Uber taxi service for pregnant mums, providing mothers going into labour with hope of reaching the labour ward. As a result there have been no maternal deaths in the past six months, and newborn survival rate is much improved. 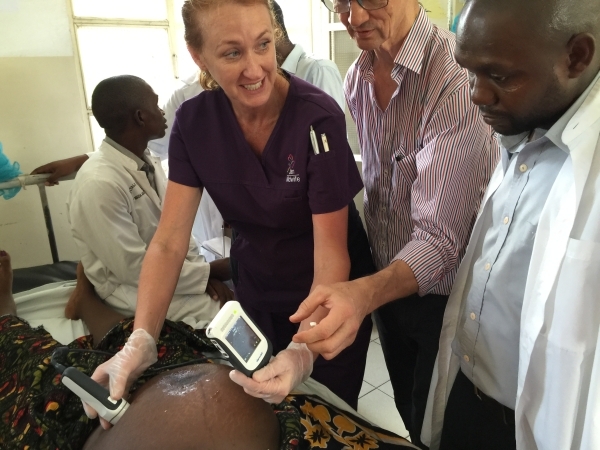 Jan and Chase return to Tanzania four times a year to volunteer their time as midwives and trainers. And once a year they bring another midwife and an obstetrician to volunteer too. They have also introduced practices such as encouraging mothers to nurse and say their final goodbyes to babies who don’t make it. They dress the tiny figures in clothes knitted by Australian and New Zealand volunteers. They make a copy of their footprints, and they take a Polaroid photo of the baby to gift to its mother, along with a Swahili poem (read the poem at the bottom of this article). For Jan, coping with the sheer overwhelm of the work is achieved by focusing on one baby or “wee angel” as she calls them, and one mother at a time. Local midwife Ndunguru and Jan – exhausted but elated after a shift on the labour ward. Such relationships, and watching improvements materialise before their eyes, are like fuel for Jan and Chase. Jan is particularly proud of the ongoing resuscitation training she provides to local midwives. She gains such satisfaction in mothers being able to undergo surgery because the theatre was working and power was on. Then, of course, there are the babies. “These wonderful babies come into the world that will one day will make this nation great,” she says. Jan shows off a newborn who survived resuscitation. The English translation of a Swahili poem gifted to mothers of lost babies, along with a Polaroid photo of their child and a copy of his or her footprints. in each butterfly’s lazy dance. are found on Mummy and Daddy’s hearts.